My favorite resorts for date nights are The Yacht & Beach Club Resort, The Grand Floridian Resort and Spa and The Wilderness Lodge with The Yacht & Beach Club resort having the best atmosphere. I love strolling along Disney's BoardWalk and stopping in at Jelly Rolls for a dueling piano sing-a-long. 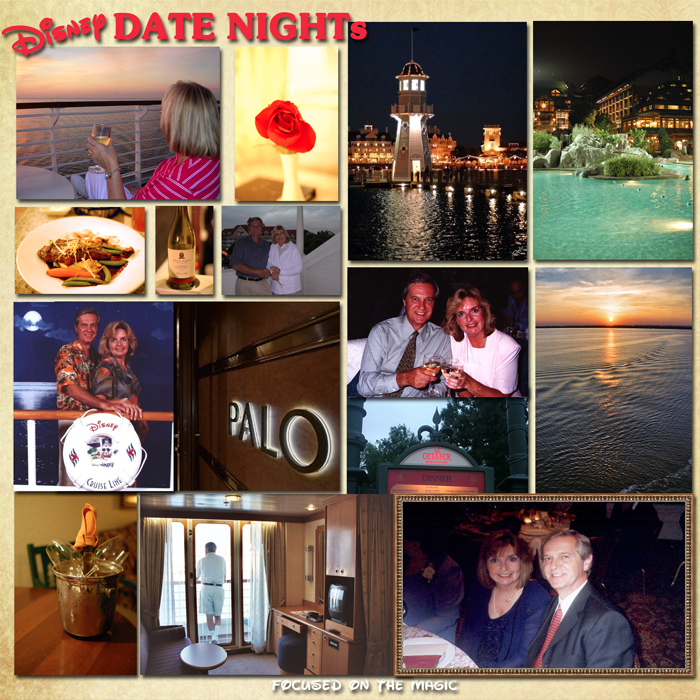 At the very top of my favorites though is Palo on the Disney Magic and Wonder cruise ships. Palo is the adult only restaurant serving northern Italian cuisine. Every dish we've ever tried there has been delicious and served beautifully. Palo is located at the top of both ships with a panoramic view of the top deck and sea beyond. Seatings start at 6pm and is the perfect spot to watch the sunset. This has been a must do on each of our 4 cruises. While on the Wonder we enjoy heading to Route 66 for drinks at the Cadillac Lounge and dancing at Wavebands. On the Magic the Beat Street section and the Rockin-D Bar offers up grown-up music and fun...and we have fun. On our last cruise my husband sang karaoke while dressed in a pirate outfit, complete with parrot and eye patch. That was a memorable date night! Do you have a favorite date night spot at Disney?